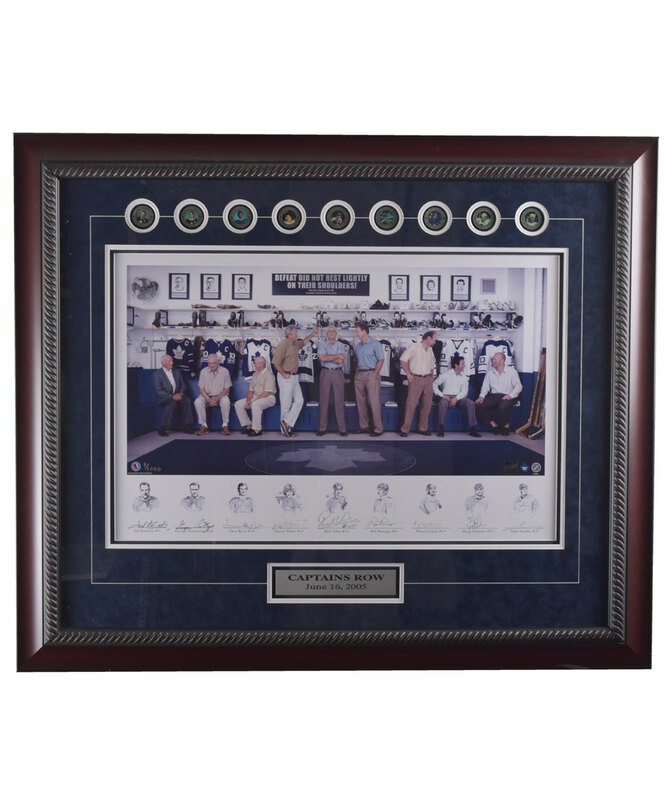 Nine former Toronto Maple Leafs team captains from 1948-49 right up until 2007-08 (missing just Sid Smith and Jim Thomson) came together to create this amazing limited-edition photographic lithograph. Each of the nine leaders appears in the Leafs dressing room with a line-art portrait below, including Ted Kennedy, George Armstrong, David Keon, Darryl Sittler, Rick Vaive, Rob Ramage, Wendel Clark, Doug Gilmour and Mats Sundin. Each has signed in blue marker beneath his respective portrait, with each of the signatures displaying nicely despite being somewhat faded, with a plaque added beneath stating "Captain's Row, June 16th, 2005". Professionally matted and framed to full dimensions of approx. 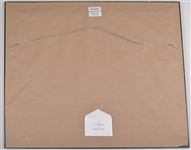 31” x 37”, our example is numbered “9/1000”, and was Ted Kennedy's personal copy, obtained from his family. A hologram (018846) has been added by Frameworth, with a COA to accompany. Ready for prominent display in any lucky collection, there is just light wear to the frame along the right side of the base.